Over the last couple of weeks I’ve had requests to pull together some of my recipes that go easy on the salt. I found quite a few and this week lemon made the biggest appearance, but tonight’s featured recipes bring in a whole host of other flavors that make it easier to go lighter on the salt. Reducing salt with out losing flavor can be managed with several steps. First of all, try to use fresh foods whenever possible. If you begin to read labels you’ll see many packaged foods contain extra fat, salt & sugar that you wouldn’t add if you prepared it fresh. And good, fresh ingredients bring their own flavors to a dish. When you need to buy something, such as canned tomatoes or frozen vegetables, go with the no-salt version whenever possible. Then you can be in control of the sodium. Adding flavors that enhance a dish is the key to cutting back on salt. Wine vinegars (especially on potatoes and meats), lemon juice (great for fish, vegetables and chicken), limejuice, and different spice mixes, including peppers, garlic, basil, rosemary, celery seeds, dill, toasted sesame seeds and citrus zest – go wild, try something new, you might surprise yourself – can transform a dish. You can also buy prepackaged spice mixes to shake on, just make sure to read the label looking for sodium content. With all that in mind, I went searching through my recipes to find ones that used a dash less salt. I started the week with Lemon Ricotta Pasta with Chicken and Spinach, recipe here. 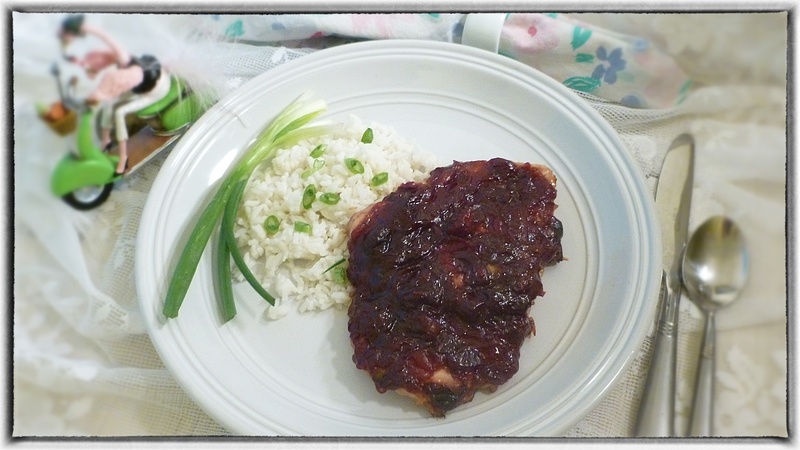 This week’s dinner menu (pictured at top) is Cranberry Chicken and Lemon Cheese Cauliflower, click here for menu, recipes and shopping list. JeffreyW makes a flavorful Shrimp,Ham and Kale in Garlic Lemon Sauce, recipe here. And finally, click here for Grilled Lemon Salmon with Corn Pepper Relish. For the pet lovers, lots of pictures of Bixby in the next Bixby Diaries installment here. How about you, what do you use to spice up a dish? What’s on the menu this weekend? Tonight I’m featuring a few recipes that bring in some sweet and spicy flavors. These beans and rice are a nice change-up from the standard Wash Day Beans and Rice I usually make. Add water & rice to saucepan, bring to a boil, cover, reduce heat and let simmer until all liquid is absorbed, about 20 minutes. Heat oil in skillet, add pork and brown on all sides for 5 minutes, add onion, celery, pepper & garlic, sauté for additional 5 minutes. Add tomatoes & spices. Let simmer 15 minutes, add cilantro, black beans and simmer additional 5 minutes, until beans are heated through. Add cooked rice & mix thoroughly. Combine cabbage, mangoes, bell peppers, green onions and cilantro in large bowl; stir gently to mix. Add Orange-Mango Dressing; toss gently to coat. Serve, or store in refrigerator up to 1 day. Place mango in food processor; process until smooth. Add remaining ingredients; process until smooth. This is a great recipe and you can cook it on the grill or indoors in the oven. Add baked potatoes or rice and fresh greens from the garden for a nice summer meal. Serves 4. Add ingredients to bag and refrigerate 1 hour or overnight. Grill on a clean, oiled grill or use a well oiled grilling pan, or broil in oven in a heavy skillet or broiler. Cook for 4 minutes on each side, or until fish flakes easily. Serve with relish. Combine all ingredients and let marinate while salmon cooks. You can use the remaining peppers in a salad for your next dinner. Had a little trouble deciding what to post tonight. We’ve been pretty busy at work and we are all a bit tired, when I asked the guys what I should post, ordering pizza instead of cooking won out. I pulled three different menus before I decided on a little taste of Sanibel Island. I like the fresh flavors in this menu and I really enjoy tuna and swordfish. 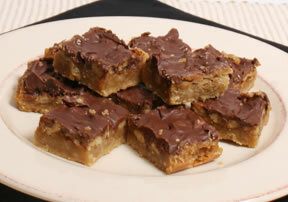 The Butter Pecan Turtle Bars are as decadent as they sound, and a breeze to make. Seed & slice peppers & jalapenos. Add everything to serving bowl and toss with dressing. *easiest way to slice an avocado is to cut in half, remove pit, cut cubes with a knife, then scoop out. In jar or mixing cup, mix all ingredients together well. Combine flour, brown sugar and 1/2 cup butter; blend until crumbly. Pat mixture firmly onto bottom of pan. Sprinkle pecan halves over the unbaked crust. Topping: In small saucepan, combine brown sugar & butter. Cook over medium heat, stirring constantly, until mixture begins to boil. Boil for one minute, stirring constantly. Drizzle caramel over pecans and crust. Bake at 350° for 18-20 minutes or until caramel layer is bubbly and crust is light brown. Remove from oven and immediately sprinkle with chocolate chips. Spread chips evenly as they melt. Cool completely before cutting. When I was in Ventura County, just north of Los Angeles, we went out to dinner to a cute little fish diner, right on the water. The fish was amazingly fresh and I realized how much I miss it when I’m not on either coast. With that in mind, I went looking for one of my fish recipes. This one popped up and I thought it sounded spring like, so that’s how we got here. When picking fish, make sure it doesn’t smell fishy, just fresh and like clean water. It should be firm to the touch and any liquid should be clear, not milky. It helps to know your butcher, they’ll usually direct you to the freshest fillets. You should plan on using it the day you purchase it. You can substitute any firm white fish in this recipe. Heat 1 tbsp oil in the skillet, over medium-high heat. Sauté onion and pepper for 2 minutes. Add tomatoes, garlic, cumin and crushed pepper, and sauté for 5 minutes. Remove from skillet and add remaining oil. Once heated, add fish fillets and cook 5 minutes, turn over, spoon sauce on top, cover and cook additional 5 minutes over medium heat. Fish should flake easily with a fork. Mix oil and garlic together. Lay baguette halves on baking sheet, cut side up and brush with oil mixture. Broil for 3-5 minutes until golden brown (watch carefully). Remove and top evenly with tomato slices, basil and mozzarella. Broil for 2 more minutes until cheese is melted. Slice and serve. It’s the time of year that I begin to crave fresh, light dinners. I’ve tired of stews, hearty soups and the other staples of the mid-winter gloom. As I start to believe spring will arrive again, I want meals that reflect that belief. Lots of fresh veggies, fresh fruits, light sauces and simple, full flavors. This menu includes items that are plentiful at my local grocery this week. All the peppers are on sale right now, so I use red, yellow. orange and green. Lots of fresh berries, too. And asparagus is everywhere. 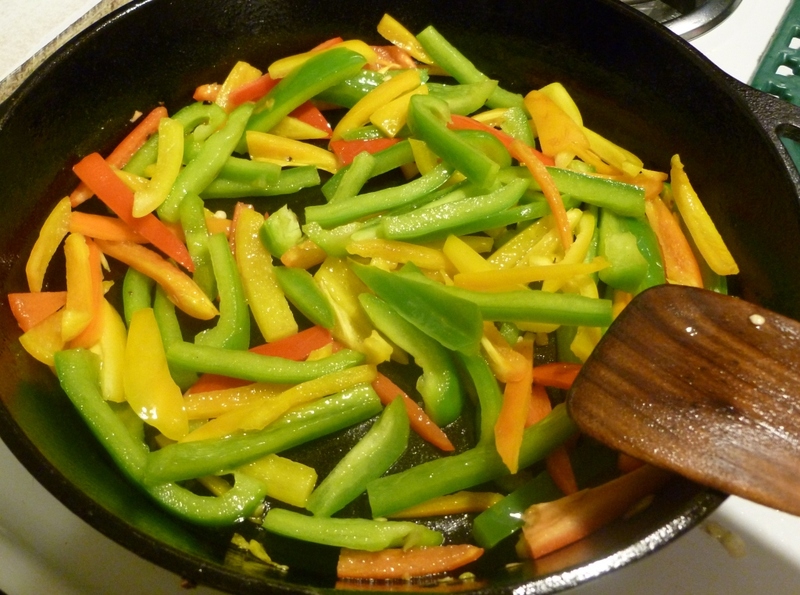 In skillet heat oil, add garlic, red pepper flakes, green & red peppers and sauté for 5 minutes on medium heat. Add fresh basil, tomatoes, salt & pepper let simmer while pasta cooks. Cook pasta according to package directions and drain well. Toss with pepper mixture & cheese. * you can use fresh tomatoes, probably 2 large, but I couldn’t find any decent ones this time of year. Gently scrub asparagus, cut in half and place in steamer. Add enough water to saucepan to come in the bottom of the steamer. Steam for 5 to 8 minutes, until the stalks are tender. Remove and toss with oil, oregano, salt, pepper & cheese. I know it’s a big party weekend, but since we’ve covered Super Bowl snacks twice already in the recipe exchange, I didn’t see how I could get away with it again this year. For those snacks ideas, click here and here. All those recipes should give you plenty of ideas for your Super Bowl Party. Obligatory, Go Broncos! What are you making for the Super Bowl? Or more importantly, what are you making for the Puppy Bowl? Might I suggest Puppy Chow? Seriously good snack! And who are you picking for the big game? Now about those fajitas. A while ago, JeffreyW posted about making his own fajita seasoning and I was curious. We emailed back and forth a few times about good recipes and then I was ready to make my own. I can’t imagine I will ever buy taco or fajita seasoning again. It’s easy to make and I can control the salt, which is a plus. And fajitas are a quick, simple dinner for any night of the week. 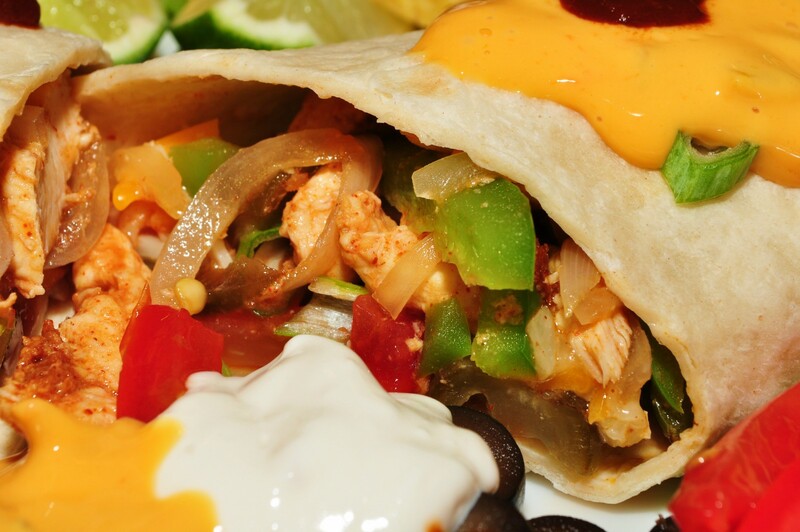 Here’s the recipe that started it all: JeffreyW’s Chicken Fajitas (pictured above), click here. Mix together the following and store in an airtight container. Slice the sirloin very thin – which is easier to do if it’s slightly frozen, then coat the meat thoroughly with 1 to 2 tbsp of the seasoning and set aside. I grilled onions in a bit of butter and olive oil until they were nicely caramelized, removed and set aside. I then sautéed the peppers with a bit more olive oil until they were soft, removed and set aside. Then I quickly fried up the beef in olive oil, adding a touch of lime and water at the end to create a bit of a sauce with the fajita seasoning. Served with warmed tortillas. Easy way to warm tortilla – wrap in foil and leave in a 200 degree oven while prepping dinner. I know this late, but I got hit with a nasty bug and about all I could accomplish this week was work. The cold weather has stayed around longer than they predicted, though except for a day, it was nothing like anywhere else was experiencing. I thought about doing soup for the menu tonight, but I’m tired of cold weather food (sigh, and it’s only January) so I decided to go for something that seemed a little fresher. I was in the store and passed by the flavored tortillas: sun dried tomato basil; jalapeno cheddar; garlic herb; and spinach and knew what I wanted to do. These are extra large and I really like the flavors. I like this recipe for company, you can make it all ahead of time, keep it warm and put it on the table and let everyone assemble their own. In saucepan, add rice, 2 cups water and bring to a boil, cover, reduce heat and simmer for 20 minutes until all water is absorbed. In other saucepan, add beans & heat on med-low until heated through. In 300° oven, place tortilla shells between two pieces of foil and warm. In skillet, heat oil, sauté onion & pepper add steak, cook 5 minutes, reduce heat & add tomatoes, taco seasoning and cook 5 minutes on medium. Put rice, beans, cheese and meat mixture in separate serving bowls, let everyone assemble their own wrap at the table. *There are a lot of peppers at my grocers, so go wild, use a couple of different colors for some added flavor. Also, please note my friend who lived in Santa Fe says it needs green chilis to be authentic. Mix all ingredients together in serving bowl. Mix ingredients together and toss with salad greens. **I really like the English cucumbers (those are the long, thin ones, usually wrapped in plastic). Heading out of town, but wanted to leave you with one of my favorite recipes. I’m off to Boston…hoping for good weather and good food. Good company is a given. When I get back I think I want to tackle some fun Halloween ideas. This is a fairly simple Chicken Parmesan and the Mushroom Confetti is a light and tasty side. Enjoy. Wash and lightly dry breasts, then coat in bread crumbs. Heat oil in skillet, reduce heat to medium and brown chicken on both sides, remove, set aside. Add onion, sauce, paste & spices and bring to a low boil, reduce heat, simmer 5 minutes. Place a ladle of sauce in the bottom of the baking dish, place chicken on top and then spread remaining sauce over the top of the chicken. Add cheese slices on each fillet. Sprinkle evenly with parmesan, top with green pepper rings. Bake at 375, 20 -25 minutes until cheese is melted and golden brown. Cut mushrooms, peppers, zucchini & tomato into uniform pieces. Heat oil in skillet, add vegetables, including corn, sauté 2 minutes, add stock & spices. Stir over medium heat until vegetables are tender. 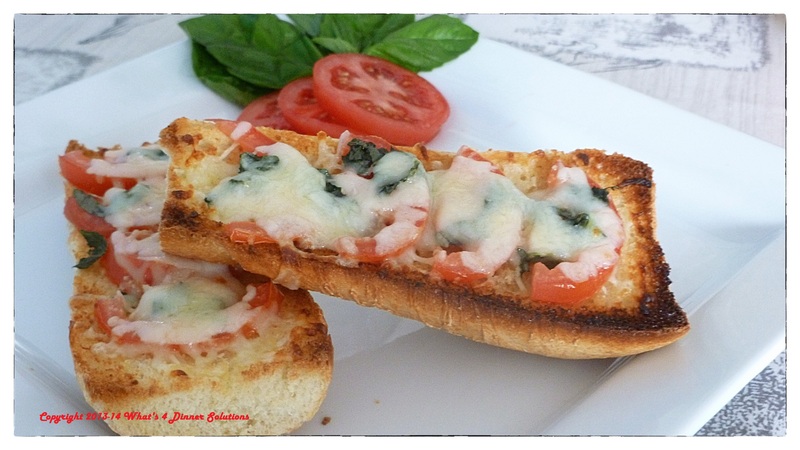 *Quick and easy garlic bread: slice loaf lengthwise, melt butter, add garlic and brush on cut side of each half of bread. Top with a little parmesan and broil until golden. Slice and serve.